Punch Bowl Canyon is located just outside of Arizona's Superstition Mountain Wilderness boundary in the Tonto National Forest. A recent trip was successfully completed utilizing (1) 190' and (1) 120' ropes. Bringing an additional 100' rope would help speed up the group, but we were in no hurry. During the trip you will encounter just shy of a dozen rappels, bring rings and webbing accordingly (there are a few anchors in the canyon that have been know to utilize 15+ feet of webbing if in need of replacement). Your short rope will be the primary tool, as many drops are on the small side and easily handled. While there is a road leading to the hiking point from the parking area, this is a restricted road with a gate, and is not accessible to the public. Please refrain from driving your vehicle past the parking area regardless of how exhausted or lazy you feel. As of today foot traffic is tolerated, however, abuse of this privilege will result in future access issues if not respected. If you drive past the gate when open, they will lock you in. 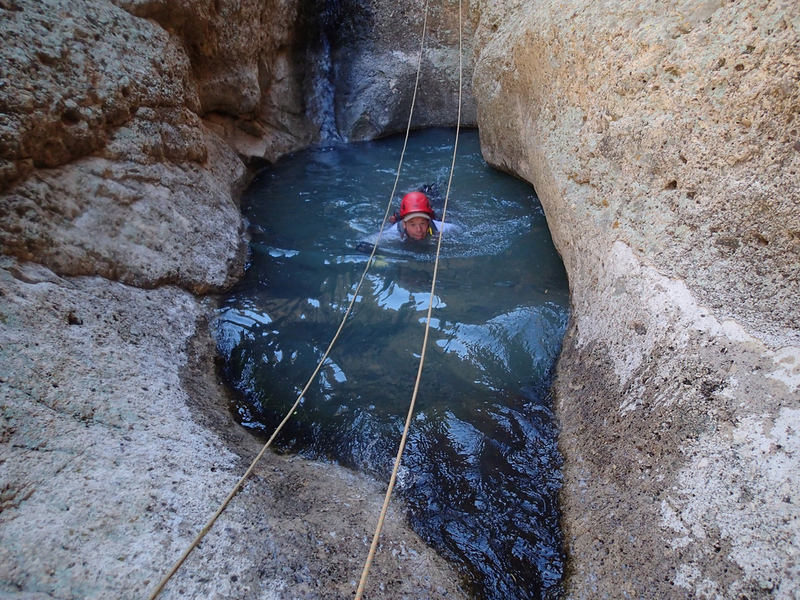 There are a couple ways canyoneers typically approach this route and each will depend on your groups experience and comfort with exposure. One option takes your group up a drainage where elevation is gained slowly and steadily, and although bushwhacking and cat-claw are involved the exposure is minimal. Another option is an aggressive, direct, and exposed route up a rock fin referred to by some as the sheep route. This second route starts in the same drainage, but has the group almost immediately climbing until you eventually find your self topping out onto a exposed, somewhat thin rock fin that can be carefully followed to the point where it intersects with the first route. The first route is recommended for any group with even the slightest concern, over the years the trail has been developing and is progressively getting more defined. Regardless of entry route, you will soon find yourself up top with spectacular views of canyon lake and the surroundings. Contouring around the cliff band will lead the group into Punch Bowl Canyon. Once in the canyon there is plenty of room for wetsuits and technical gear to be pulled on. Once geared up, just a few steps forward and you are at the first rappel of the day. A few swimmers, some down climbs, and some great scenery will be encountered throughout the day with the final drop landing the group at the Punch Bowl. When clean, the punch bowl makes for a great deep pool to jump into just prior to starting the two and a half mile hike back to your vehicle.